Before Amina represented France at the Eurovision Song Contest in 1991, she already had a little career of her own. The album 'Yalil' was released in 1989, and featured the single 'Belly dance'. The single was remixed by Paul Oakenfold, who was already a big name in dance circles. After Eurovision, Amina released one more album in 1992 before disappearing from the scene, only to reappear with another album in 1999. Her success remained limited to France. Amina Annabi was born on March 5, 1962 in Carthage, Tunisia. She started to forge a career in music in 1978, when she formed a group. After five years of playing in schools all over France, she started to go solo. By that time she got involved with Radio Nova, the leading radio station in Paris for world music. One of the producers of the station was Martin Messonier. He started to work with Amina - a relationship that eventually became romantic as well. Their daughter was born in 1986. Her debut solo album 'Yalil (Night)' was released in 1990. A year later, she was awarded 'Le prix Piaf' as Best Female Singer of the Year. 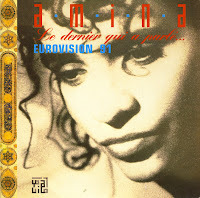 Also in 1991, Amina represented France in the Eurovision Song Contest with a song of her own, entitled 'Le dernier qui a parlé...'. She tied with the swedish participant Carola for the first place but due to insane EBU rules, the French entry ranked second and the award was given to Sweden. However, this single was the artistic triumph of the two. In the Netherlands, it was also a bigger hit: the single peaked at number 35 in the Dutch Top 40, whereas Carola's single flopped.